Marketers know that unless you call people to take action, they won’t take action. I set out to quantify how much of a difference this makes for Youtube video subscriptions, shares and likes. For the too-long-didnt-read (tl;dr) crowd, the spoiler is that calling to action makes a 31x difference, or 3100%, in converting viewers to subscribers. Try getting that kind of lift in your average split test! There are five video screenshots here, with accompanying stats. They’re ordered from most successful at converting viewers to least successful. The best gets 0.63% conversion rate, and the worst 0.018%. 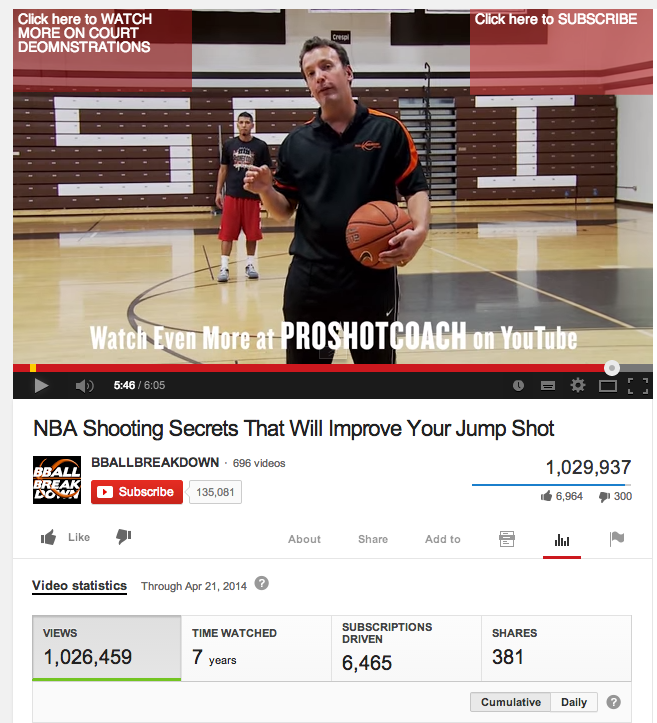 This instructional basketball video has calls to action to subscribe and encourages viewers to see more of their videos. They achieved a 0.63% conversion rate, which is pretty good by Youtube standards. More commonly, videos will get a roughly 0.5% conversion rate (rather than 0.63%) as is the case here. Note that the smaller red annotation call to action (“click to subscribe”) is present from the start of the video. Who better to learn basketball from than perhaps the greatest player of all time, Michael Jordan himself? Well, judging by the subscriber conversion numbers, it seems many people would rather learn from relatively anonymous people. The conversion rate is 0.06%, or roughly 1/2000 viewers. 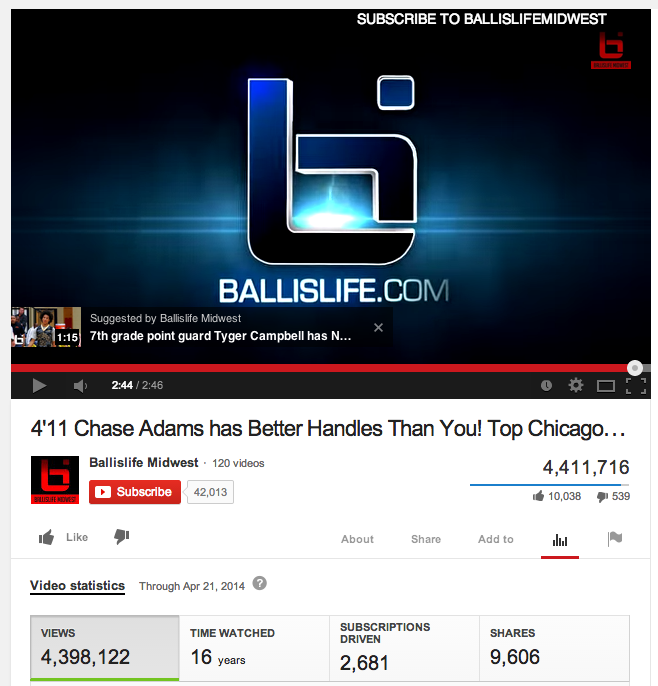 This video doesn’t invite viewers to subscribe, and so despite having 22 million views, the channel has only 4,000 subscribers. If we assume that they all came from this video, which would suggest the highest possible conversion rate, then this video has 0.018% conversion rate, or about 1/5000. To clarify the above, I’ll define how I’m measuring conversion rate. Here, it means subscriptions driven by the video divided by views: subscriptions/views. You can criticize my conversion rate measurement for a number of reasons. For example, some people may have watched it multiple times, which means that really a higher percentage of individual viewers are converting. That’s true. Unfortunately, there’s no way to tell which videos are watched with greater repetition than others, in order to adjust for this. Another possibility is that viewers’ shared the channel’s link or other situations where the tracking would not attribute a subscription to a specific video. Again, this is true but nothing can be done to adjust for this. Yet a third point is that some video producers may prefer other results, such as clicks to a site, shares, likes or comments. To this point, I tried to avoid videos that obviously prioritized those calls to action over a subscription call to action. Whatever problems the measurement has, it’s consistent across the videos. So hopefully any errors are roughly equal across all the videos. I think it’s noteworthy that the videos that generated the most subscriptions were for channels that promise additional worthwhile material for subscribing. You can see this promise made explicit in the white text of the best converting video, inviting folks to watch more. Contrast that with an obviously pirated video from a local news channel, where it’s unlikely that subscribing will yield more such videos from the same author, or more tutorials from Michael Jordan. So getting a 3,100% subscription difference is in comparison to a channel where people inherently aren’t interested in subscribing – it’s a synergistic effect, and not only due to the call to action. That’s why the title says “up to 3,100%” difference. Nevertheless, if you compare that to the middle of the range like the BallIsLifeMidwest channel – which also offers tutorials and an implied value promise to subscribers – it’s still about 1000% better, at 0.63% vs 0.06% conversion! 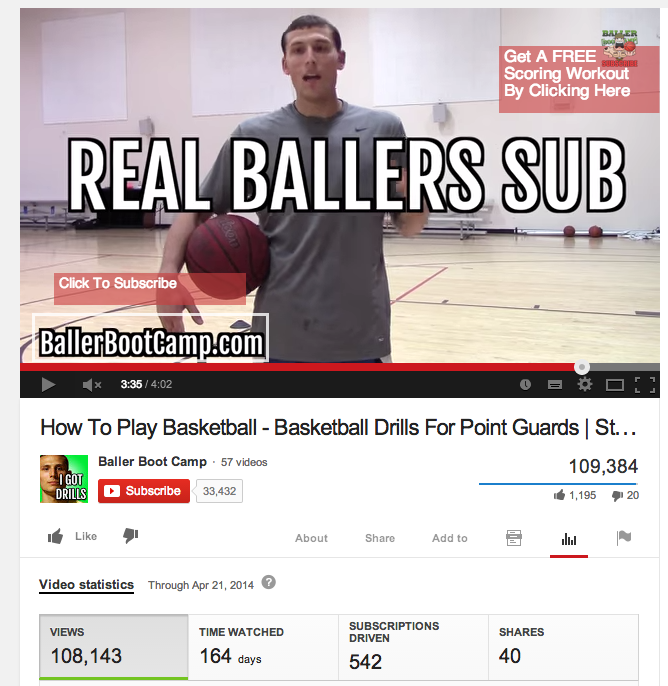 Gab, being a hoops fan I must say BallIsLife has it down! Great channel, and asking for the subscribe makes all the difference. Be explicit. Tell people what to do on video or through notes and more people will do it. No lack of clarity here; be direct! I found this post on kingged(dot)com and will vote it up to boost your traffic.